Until her 17th birthday, Ellie is an average teenage girl. Or rather, your very wealthy, average teenage girl. She goes to school, hangs out with her friends, buys expensive clothes, gets an Audi for her birthday, etc. The only thing that sets her apart are frequent disturbing nightmares in which she's being chased by monsters and having to fight them off with swords. Right around her 17th birthday, a mysterious boy named Will appears seemingly from out of nowhere. On an evening walk together, Ellie and Will are attacked - just like in Ellie's nightmares. To Ellie's great surprise, she fights them off using swords conjured from thin air with angelfire. She knows what to do, because she's done it a thousand times before. Ellie is the Preliator, made to destroy evil reapers with angelfire. She is mortal, but is reincarnated every time she dies. Will is her guardian, sworn to comfort and protect her constantly. They have been compatriots for hundreds of years. As Ellie becomes acquainted with her new (or old) powers, she and Will are continually challenged by reapers who seek to kill her. Then suddenly, they discover something that might possibly kill Ellie for good - no more reincarnation, no more Preliator. Can Ellie and Will get rid of this "thing" before the reapers get their hands on it? There are so many reasons for me to dislike Angelfire. First, I don't like angels as paranormal creatures. The fall between Lucifer and God, nephilim, devilish creatures, etc. bores me. I don't know why. So that was one huge hit against Angelfire. Second, a lot of the dialogue during the fight scenes, when the reapers are taunting Ellie and Will, is bad. It's like something out of a B-grade movie. Or a C-grade movie, if such a thing exists. Third, Ellie goes out of her way to remain a normal teenager. That's laudable for many reasons, but if I suddenly discovered that I was a Preliator and would soon be facing devilish creatures with far more fighting experience than me, I think I'd focus a bit more on training than partying. Fourth, there were a few plot points that seemed like they were going to play a role in the ultimate conflict, but went nowhere. I don't know if these were red herrings or if they'll be significant in future novels. This isn't really a complaint, but it struck me as odd. 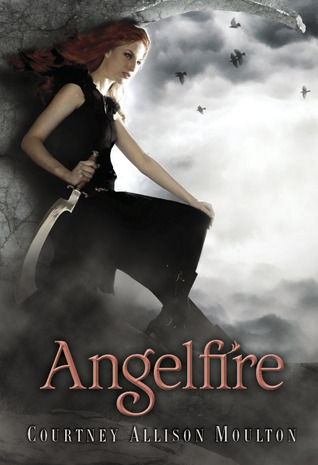 Ultimately, Angelfire gets a good rating for me for one reason: I couldn't put the book down. There were times when I was groaning over things I didn't like, but when I would walk away from the book (or actually, my iPod e-reader) I missed it. Suddenly, I was reading Angelfire at the gym, at my breaks from work, at times when I would normally be playing on the Internet. It wasn't that the book was so suspenseful that I had to instantly know what was going to happen. I just enjoyed Moulton's writing and being in Ellie's world, even when that world annoyed me. A few other good things about Angelfire... Will is a great love interest. He is quiet, sweet, very protective without being controlling, and incredibly devoted to Ellie. He was different than a lot of other leading guys - he wasn't sarcastically funny, he didn't have powers that placed him at a higher level than Ellie, he was haunted by the past without being emo. He was just an enjoyable, cool guy. I liked the dichotomy between Ellie's very normal life and her fighting. I said in the above paragraph that I thought she didn't take her situation seriously enough, but I did enjoy reading the interraction between Ellie and her friends. They seemed like very normal teenagers, in a way that I was never a normal teenager, so I can only assume they are normal. Kate and Landon were great friends - not just wacky goofballs like so many literary sidekicks. Their dialogue was casual without being overrun with slang. And Ellie will likely be a happier person if she can balance her duties as Preliator and being a normal person. Some people might quibble about Ellie's wealth and how buying expensive clothes and fancy cars are made to seem like no big deal. There's a place for all socioeconomic levels in YA. I know plenty of people who grew up with similar amounts of wealth and her life seemed believable in that context. Your all-American wealthy teenager, as opposed to your Gossip Girl teenager. Also, the angel mythology was well-developed. You understood how the fall between Lucifer and God, regular angels, fallen angels, reapers, nephilim, etc all fit together. The reapers were interesting, complex creatures. There were lupine reapers, bearish reapers, and human reapers, and you learned a lot about them. Ellie's slow recollections of her past help both Ellie and the reader get caught up with the mythology. Even though I have plenty of quibbles with Angelfire, I was quite enthralled with the book and cannot wait to read the next book. Will sounds great, can I have one? It sounds like an interesting book--I'd probably pick it up if I saw it in the library or could borrow it. The description of the book reminds me of the Disney movie Wendy Wu: Homecoming Warrior combined with a dash of Buffy the Vampire Slayer. Good review! Sometimes if a book is entertaining enough, we keep reading just to find out what happens regardless of the flaws. This must be the case with Angelfire. I don't know if I will like it or not. If I decide to read it I will definitely pick it up from a library rather than buying it. Thanks for such a balanced review. Very nicely done! I'm really looking forward to reading this book, but a few things in other reviews made me a little worried (her partying/priorities, for one). I'm glad to see you didn't like those same features but still enjoyed the book overall. I'm going to read this one next. Despite the weaknesses that you mention, I hope I enjoy it overall like you did. Looking forward to meeting Will! I really liked your review style, and I just bought Angelire last weekend. For my debut challenge after reading your review, I want to put down The Iron Witch also a good book so far. And read Angelfire.